Tell President Obama That We Don't Want Fracking Here, or Anywhere! Fracking bans, like baseball, started in Cooperstown. 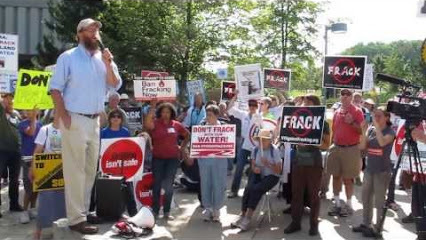 The Village is located in the Township of Otsego, the first town to ban fracking in New York, and in the Town of Middlefield, one of the first towns to defend its fracking ban in court. The citizens of Cooperstown know fracking would destroy their thriving tourism industry, which has been a viable and sustainable economic force for the small towns and villages of upstate New York for well over a century. President Obama will be speaking at the Baseball Hall of Fame to promote tourism, but if he truly wants to support tourism in upstate New York, he needs to change his view on fracking. So join us from near and far to tell President Obama: no fracking way! CARPOOL: Sign up here to carpool from Binghamton, Ithaca, Syracuse and elsewhere Bring food, water, weather appropriate clothing and appropriate footwear!